Star Power - A Special Program For Youth. "Star Power" combats destructive behavior in our youth and prepares our next generation of leaders for success. "Star Power" is a special two-hour program that includes fascinating advanced modalities such as Positive Psychology and Clinical Hypnotherapy, wrapped in a highly entertaining educational package that youth relate to. The goal is to help attendees realize and experience their innate abilities and potential under the direction of Dr. Frank Ricci. Star Power eliminates inhibitions quickly and the attendees display their hidden talent they previously were reluctant to expose. The program has been video taped and played back in a classroom setting where students viewed themselves displaying their hidden talent which in turn dramatically increases their feeling of self-worth. As a result, participants adopt a new passion for life and a heightened awareness of self-worth and respect for their body. This transformation effectively combats any desire for substance abuse such as addiction to drugs, alcohol and tobacco, that can easily derail a young person's otherwise bright future. Life truly takes on a whole new meaning and the results can be dramatic and immediate. The following endorsements bring to light the success of this innovative program. 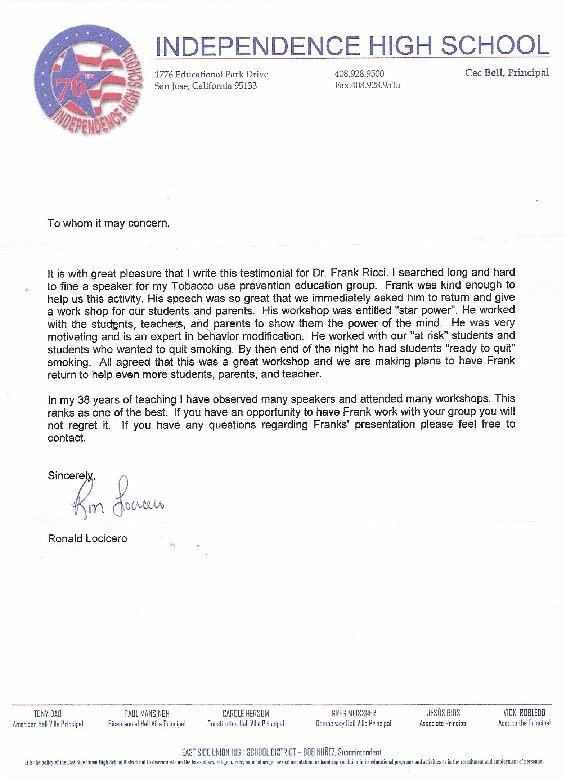 "It is with great pleasure that I write this testimonial for Dr. Frank Ricci. I searched long and hard to find a speaker for my Tobacco use prevention education group. 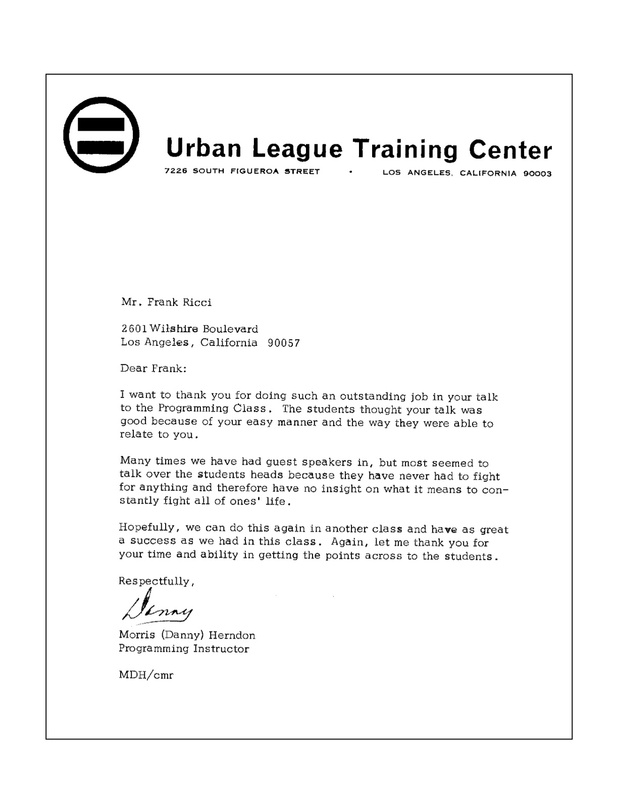 In my 38 years of teaching I have observed many speakers and attended many workshops. This ranks as one of the best.He was very motivating and is an expert in behavior modification. By the end of the night he had students "ready to quit" smoking. "Amazing! You are incredible!! The best thing we ever did. Thank you for making it such a memorable evening for our students. Your event was fun, motivating, and appropriate for our audience. "Endeaver School of Fullerton for trainable mentally retarded is proud to present this unique humanitarian award to Frank Ricci. Awarded for the unselfish love friendship and understanding he has shown for many years to a Down's Syndrome child." - Endeaver School of Fullerton, California. "The class was very impressed and found your talk informative. They expressed that your talk was for them and not someone talking down to them. Some images from this site were obtained from public websites and are believed to be in the public domain and in accordance with our rights found in the U.S. Copyright Fair Use Act (Title 17, U.S. Code).